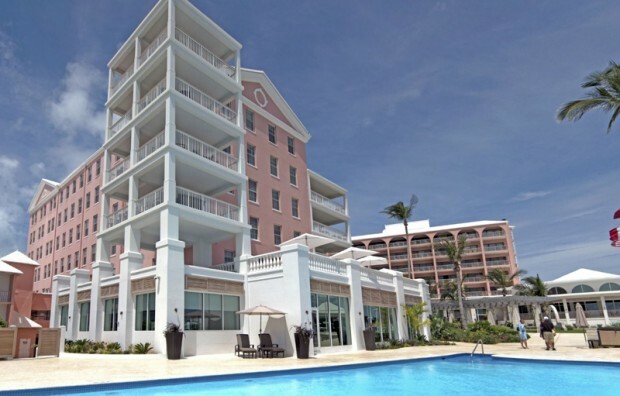 The Hamilton Princess & Beach Club has “just completed its most successful May in the history of the hotel” and “paid $200,000 in overtime to our employees,” the Hotel’s General Manager said. General Manager of the Hamilton Princess & Beach Club Allan Federer said, “In response to mounting speculation regarding hotel occupancy during the America’s Cup, we would like to clarify that the Hamilton Princess & Beach Club has just completed its most successful May in the history of the hotel. “Furthermore, June will be the best month ever. As a result, we paid $200,000 in overtime to our employees. “Hamilton Princess & Beach Club is a multi-dimensional business with 600 employees across various departments. We have not laid off any employees. Excellent news ! We have not laid off any employees. Of course not ! In the slow periods , there were slow periods you know , employees were given the oppurtunity to fill in as cheap labor on the Bermudiana road development . He is not lying , but not telling the truth either . what is your point? obviously that is why what the gvmt is doing is a GOOD THING now. When the OBA sail to victory in July, I hope the combined opposition will sit back eat some humble pie take a few notes. Then shut-up and learn. Good luck in 2022. So concerning occupancy, what are the numbers then, the ‘occupancy rate’, since speculation is that hotels are NOT full as people claimed they would be? Clearly it is not 100% or they would have put that in the headline and saying they had the best May ever is too ambiguous. Are rooms being rented at hotels and VR properties at 2 to 3 times normal rates like people are saying or not? Contact them and ask them. They’ve every right to ignore you. It’s a private business and can give as little or as much information as they like in press releases. Because even a private business cares about its reputation, for example if people are going around saying its strategy is a failure when in fact it is wildly successful. You seem to be unhappy that the AC has been successful. The chances of that happening is minimal, you would be correct in saying, had you added, under the PLP. Exactly! And these sheep follow right in tow.. Wouldn’t one expect that the host hotel for a major event be doing well? Record numbers. The best ever. Well I have every right to ignore them or question this public declaration, they say they made this statement to clarify concerns raised about projected hotel occupancy, which is expressed as a percentage and should be public knowledge since hotel concessions were originally supposed to be incumbent upon low occupancy levels that made this type of tax payer funded bailout necessary. They have tried to be clever by throwing out irrelevant numbers and claims that don’t directly address the question that they profess to be bringing clarity to. Two days after an election is called this sure sounds like an attempt to bolster the “OBA has fixed everything” message. AC35 didn’t start until the last days of May so why would you think that occupancy would be 100% for the whole month of May? Because, So many of the AC team have been there for a few months prior to the start of the Cup. Also, in May, sponsors, additional help for the team started to descend on Bermuda. I know this, because I know people who works at the Hamilton Princess and I rented my house on May 15 for 7 weeks. Your negativity is outsanding! Why can you for once admit that Hamilton is busy. Just over 2 years ago, if you went to Hamilton during the week at night it was a ghost town! Be happy for Bermuda, put your politics aside just for once! What was the occupancy level for May? That would give a better picture of whether it was truly the best May ever! They might be at a lower residency, but are charging a higher rate due to AC. They might be including food and beverage sales and mooring rentals. It’s kind of up to the owners to use whatever criteria they wish to judge considering it’s a private business. You think that you know better than the hotel manager? And how is it actually any of your business how a private enterprise is doing? It”s like explaining something to an utter moron. It’s the most busy the Hotel has ever been. Ever. Yet they still whine and complain and moan. By “they” I mean the negative commenters. Reading comprehension not your forte’ Zev? It says the busiest MAY month ever, you got it? You are correct. But then the story goes on the say June will be the best month EVER. I’ll take it. Did you have a go at reading the article then sage? I see you didn’t get as far as the third paragraph. Like I said, it’s like explaining something to an utter moron. You helped prove my point. The real question is why is the Princess commenting on their results?? The Green family are obviously confident in Bermuda, based on the redevelopment of the commercial building on Front Street, renovations to the Princess and the new Beach Club on Southshore. They have also been generous with various community donations. If they are prepared to comment on the overall profitability, will they then tell us how much they made on a net basis for the month of May and then for the full year? Remember that they received a $14m concession toed to the hotel refurbishment. I trust they are not responding to bolster claims by the OBA that the Americas Cup has been super successful. It is an open secret that the hotels are not experiencing 100% occupancy but that is not the fault of the Princess. As with other posters, the real measure is occupancy. That is a simple, factual number to report. Some folks wouldn’t know success if it walked up and clobbered them across the forehead. Oh yeah…if the story doesn’t fit the two Bermuda narrative it can’t. be right. NEWS FLASH. There is one Bermuda and we are all in it together to make it work. Divicive hateful rhetoric is a past tactic. Look forward Bermy not backwards. Thank you Green family for believing in the potential of our beautiful Island home. There are places for all at the table. Thank you OBA for bringing the AC to Bermuda and for getting the country back on track. We NEVER want to go back to the brink of financial ruin again!! Thank you, Thank you, Thank you!!!!!! People must have heard how great the Jitney driver, Quad Deuces, is and now they’re flocking in droves to experience his hospitality and driving. That’s great news that the boys are getting such a great return on their investment. Very saddened to hear of Mr. Crockwell’s passing just a few minutes ago. RIP. Such excellent news for Bermuda. Very happy for The Hamilton Princess. They led by investing significantly in their product and they are reaping the benefits. Well done to all those involved in our tourism product including the BTA, the OBA and, ofcourse, The Americas Cup. Bermuda is back and everyone can feel it. The Diahorea trail is lookin goud. I can understand that the PLP are feeling threatened by the overwhelming success of the AC as an investment for the Island, but they have overdone the mean spirited negativity, and have lost any credibility with people with rationalthought. Oh No! David Burt is right. All of these employees suffering under the OBA! Fantastic results! With increasing tourism numbers for 16 months so far, the future is looking much brighter for tourism and Bermuda. With massive, never experienced international exposure, directed specifically at the demographic Bermuda needs to attract, we are on a much stronger footing than for the last 25 years.You can’t help but feel the buzz in the air, even if you are trying hard not to! It’s impossible to ignore. On top of that, we are attracting top billing names in entertainment now! I hear Sia at HP this weekend. Next weekend possibly a trip to Mars! I’ve got my tickets just in case. Now that the hotel industry is in profit, perhaps the tax breaks they get to employ hundreds of expat workers could be raised to match the rates that non hotel local firms employing mainly Bermudians must pay – two points higher on the payroll tax due, new duty breaks on stuff for capital investment, etc. I cannot help but feel that small businesses like mine are in fact subsidising this industry. You negative people get right on my nerves be happy that YOUR ISLAND is finally trying to get back on its feet. If the PLP would have done this you would see nothing but positive reviews but they did not and you all know that that’s why the OBA is in and thank god for that or we would not be in a very good shape today. The PLP did nothing but take care of themselves and you know that including the Education. And if I hear one more time out of David burts mouth how the OBA Is dividing the people really what a load of S I have never heard a thing like that out of any of the OBA mouths, remember your old leader who is right now hiding behind the curtain say he will pull YOUR ISLAND down to its knees oh ya you have all forgotten that haven’t you. Where are the brown, cox, burch etc can’t show there face very sad. The Lois brown Evans and Freddy wade etc would be ashame of all you lot excepting that BS they never hind behind the curtain. OBA is for all people so what if there many rich elite people on this island at least they are spending lots of money and I am positive they will be back. Grow up and get over it. OBA all they way. Stop using the race card at all your elections you plp are the one dividing the people as usually. It is a legitimate question that Bob Richards needs to answer: Why does big business get the tax breaks and small Bermudian owned businesses the tax increases? By the way, where do I mention race or the PLP in my earlier post? Is this the same family as the agreement who sold the British home stores? It is pretty clear that the hotel was not 100% occupied. In the hotel industry that is almost impossible, given that each guest is not homogeneous. Some people stay for 2 days on business, some for a 10 day or more holiday..and everything in between. Add it all up in a reservation system and you will get nights you cannot sell, no matter how much “juggling” you do. I suspect their occupancy was great and this, combined with the Marina etc. created the best May they have ever had. But the Hamilton Princess should not be the only gauge as to the success of the AC. I think it is fair to say everyone involved in the industry did (and is doing)really well. It has not been the mad house rush to come to Bermuda we all expected, with cruise ships needing to be brought in to handle the overflow and there is always room for improvement, but it has created an excitement and put our little island back on the world stage. That is undeniable. Back on the world stage for whom, exactly? Hey, I wonder if there is like, the biggest sailing race in the world going on, or something? What, oh what could be causing this record-breaking uptick? Very mysterious indeed. Plenty of willing Bermudians who could use the work. Oh Sorry, they’re the ones who left – if you include them, the real figure for folks unable to find work would be a lot closer to 20%. A real tragedy when you cannot find work in your own country. Just reading this again … 1. interestingly it does not state hotel occupancy rates 2. the most successful May, since the Greens too over, or ever?